As with most technical documents of this type, I wrote this because I could not find this information no matter how many Google searches I tried. 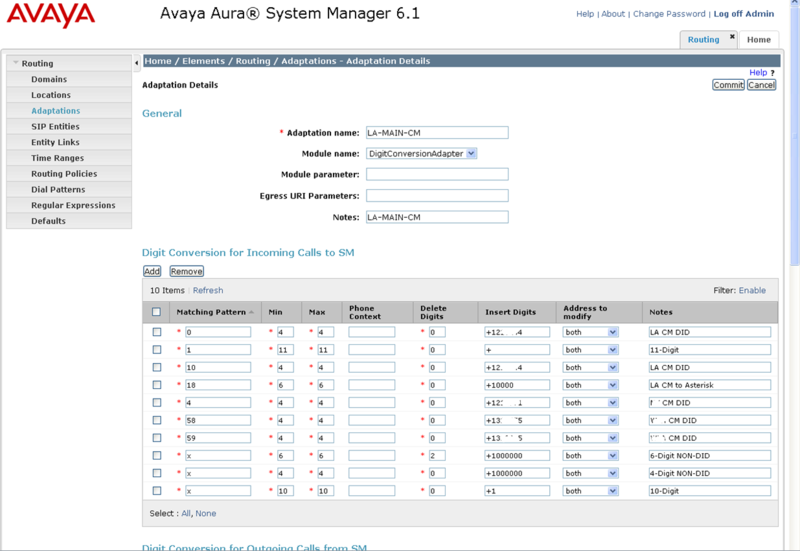 There’s information about connecting Avaya Communication Manager directly with Asterisk using the H.323 channel drivers, there’s information regarding integration with the Avaya SIP Enablement Server, and I did find some information about some older versions of System Manager. However, even the information I did see was a simple lab assignment. There was no information on actually using the new integration to do cool things. Some of you may have been tasked with integrating the Avaya PBX with Microsoft Lync. This tutorial provides a great proof-of-concept for Lync integration. We can test everything with Asterisk and it all in the telecom sandbox at your company. This tutorial is for those of you who already have an Avaya Communication Manager and one or more Session Managers already set up – probably because you’re using Modular Messaging 6.x. Therefore, you have all the ingredients you need to add Asterisk to the mix. And note that the node name is IP address 10.5.20.139. So in a nutshell, when I dial the voicemail pilot number, the call gets routed to my local session manager 10.5.20.139. That’s pretty much all we needed to know from the Communication Manager point of view. What we really want is to set up a new route with new extensions between Communication Manager and Session Manager. Next we’ll configure Session Manager to understand a new number range and route it over to Asterisk. In the case of a single pilot number, I could duplicate the hunt group method that is already set up. However, for more flexibility, I wanted a range of numbers to route to Asterisk. Or even if I do want to point individual numbers, I don’t want to create hunt groups for each one – I just want the number to route over to Asterisk through AAR routing. Fortunately CM is very forgiving with aar vs. ext. If I can digress for one screenshot, note that my dialplan analysis table defines all four-digit patterns that begin with 4 as extensions. However, I am able to override this in the uniform dialplan table and point these to aar in the table entry above. Now any four digit numbers starting with 44 will route (via route pattern 90) over to my session manager. Next, we need to configure session manager to route these to Asterisk! Now, I don’t know your experience with System Manager, but it seems that if I turn my back for a few weeks, the Admin password stops working and I have to reset it via SSH. Hopefully you have better luck than I do. Major Gotcha: The first time I worked on this routing in System Manager, I just couldn’t get the calls to work. They would die in Session Manager with extremely unhelpful errors. After some troubleshooting, I discovered my changes weren’t synchronizing between System Manager and Session Manager. I had to go into Home->Replication and “repair” the replica group. I have done this several times since then and all of my calls during replication route fine. I don’t think it is service-affecting (with my configuration anyway). Your results may vary. Be careful. I’ve worked on PBXs for a long time. Naturally, it can sometimes take a while to get comfortable with the GUI or command line of new systems. System Manager was tough for me. It’s such an abstraction from the actual routing engine (Session Manager) and I don’t get a chance to use a command line. I guess web interfaces drive me crazy for that reason – they’re a front-end to the actual magic, and I like to be closer to the soul of a PBX. Enough rant – the actual configuration all takes place within Home->Routing. I just went in order down the list on the left. First, I configured a location called “LA-Asterisk”. Next I created an Adaptation also called LA-Asterisk. Note in the screenshot below, there is a 4-digit extension pattern defined. We will do this later. Don’t worry about dial patterns or regular expressions on this screen. Just set up a SIP Entity and Time of Day and commit. I’ve erased the DID numbers there – I’m not much of a photo editor. You can see how the various extension ranges and lengths translate into E.164. Note that four-digit non-DIDs are translated to +1000000xxxx. This is how Avaya set up this site and I assume the best practice. I work at another site (set up by an Avaya business partner) that was not normalized to E.164 and it’s been kind of a pain to manage as we’ve added DIDs and extensions. Why would you want to do this? Well, this is how the Avaya technicians originally set up the routing to Modular Messaging. I suspect it allows the SIP header to retain the original dialed number as it is passed across. There’s a “diversion” header in the SIP invite, and this is how the originally-dialed number gets to Modular Messaging. I happened to set this up in a desperate attempt to get Session Manager to route for me. When I use the traceSM utility in Session Manager, I noticed that Session Manager was not trying to find a match for this pattern. This is when I discovered that the replication wasn’t working between System Manager and Session Manager. Once I fixed the replication, the rest of the routing worked and I left this in place rather than pull it all out. More on traceSM later. Once you create a regular expression in System Manager, you should see an attempt to match it in traceSM. I wasn’t seeing my new patterns in this “Trying…” list. If you don’t see your patterns, it may be time to repair the replication. Ok, so you finally have CM configured, and you think you have Session Manager/System Manager configured. Now for the last step. In my case, I was happy to finally get to Asterisk. Getting back to my rant about Session Manager, I like Asterisk because it’s completely command line and config files. This allows you to get very close to the inner workings of Asterisk. Asterisk was a simple two step configuration: sip.conf and extensions.conf. And add these lines to /etc/asterisk/extensions.conf. 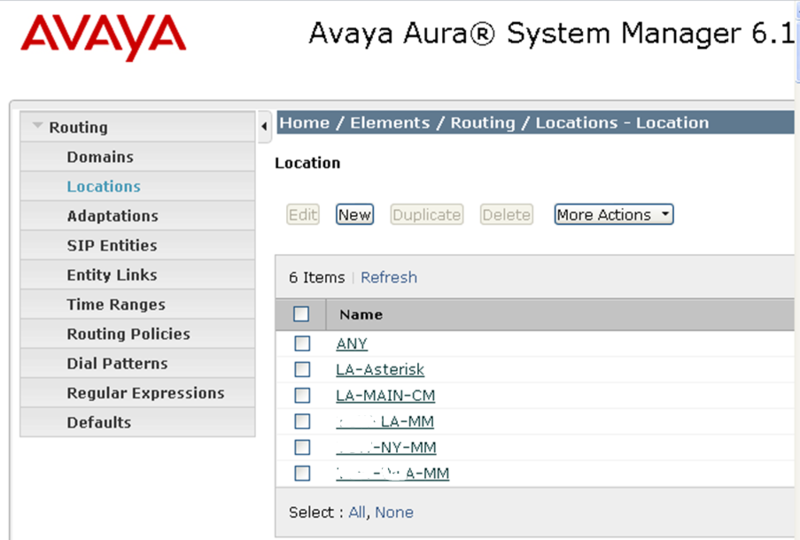 Note that we’re creating a context for our Avaya Session Manager and adding it to the default context. Later you can pull this out, but for now it provides a nice way to test incoming calls by sending them to the “congratulations” demo that came with Asterisk. ; probably don't want to have the demo there. We can see from this trace that the call to 4498 goes over route 90 to trunk group 91. Perfect. Now let’s watch Session Manager. If you haven’t had the chance, you can trace calls within Session Manager via a tool called traceSM. At first I wasn’t sure about it, but I’ve come to really like it. SSH into your session manager (the management interface, not the traffic interface) and login as ‘craft’. If you know your Avaya systems, you’ll know the default password. Then type ‘traceSM’. After a few seconds of loading the log file, you’ll be ready to trace. If your system has a lot of traffic, you’ll probably want to filter your results. Type ‘f’ at the screen and filter by your test extension. And if you could hear what I hear, you’d enjoy Allison Smith’s congratulations message also! We have inbound calls to Asterisk. This one is a little easier. 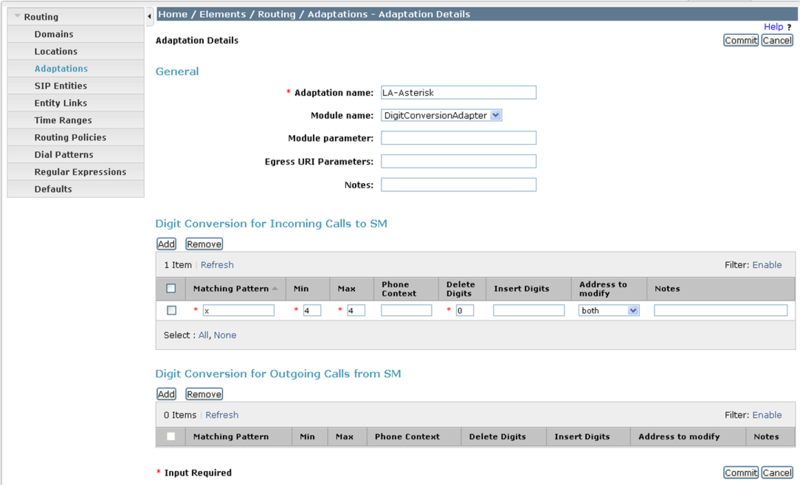 To send internal calls to Avaya, just create an extension match in extensions.conf to match your internal number ranges. However, don’t forget that you are probably sending some numbers from Communication Manager to Asterisk. Be sure not to send these number ranges back to Communication Manager! In my case, Communication Manager is sending 44xx to Asterisk so I make sure I keep those numbers internal to Asterisk by dialing any registered SIP phones (more on this later). To test this, you can issue an ‘originate’ command right from the Asterisk CLI. The command above causes Asterisk to launch a call to 2245 through the avayaLA peer and send the call to extension 1000. You should get a call and when you answer, you’ll hear the demo. Likewise, external calls should include the ‘9’ when sent to Communication Manager. Your system will probably pass this through Session Manager to Communication Manager just fine since Modular Messaging needs to dial out sometimes (for find-me/follow-me features). So that’s it! You now have an Avaya Communication Manager sending and receiving calls to Asterisk via Session Manager! This is a great proof-of-concept for you to start your Lync integration. I’ll write up a separate article for Lync. There’s an amazing amount of politics involved in a Lync project. I’d love to hear from you about it. This entry was posted in Avaya, Microsoft Lync, pbx, voice on May 26, 2013 by roger. Hi, i do this as a lab in my office, just i get a Not route to determine on SM, i dont know if I’s missing somthing in asterisk or in SM, can u give me a clue? The calls from CM or SM to Asterisk works great, its a sip trunk with udp tranport. I would check for a “routing policy” between your CM and Asterisk. It needs to match a string of digits or a regular expression. I almost always match by digits (I’ve only used the regex for voicemail apps). Do you have a digit pattern defined to a routing policy? 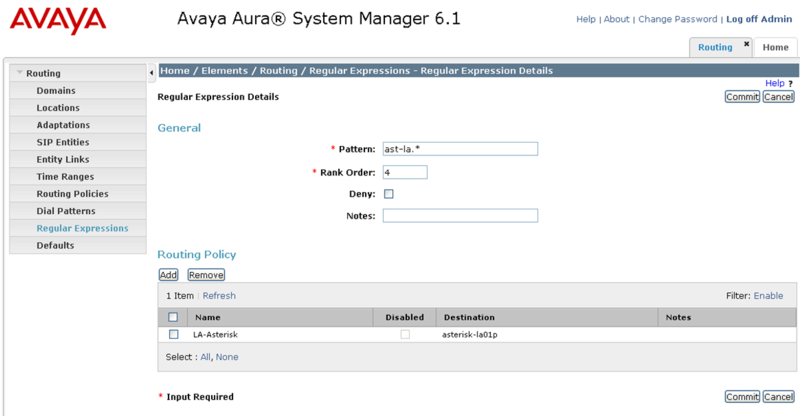 We are doing SIP integration between Avaya and Asterisk…. 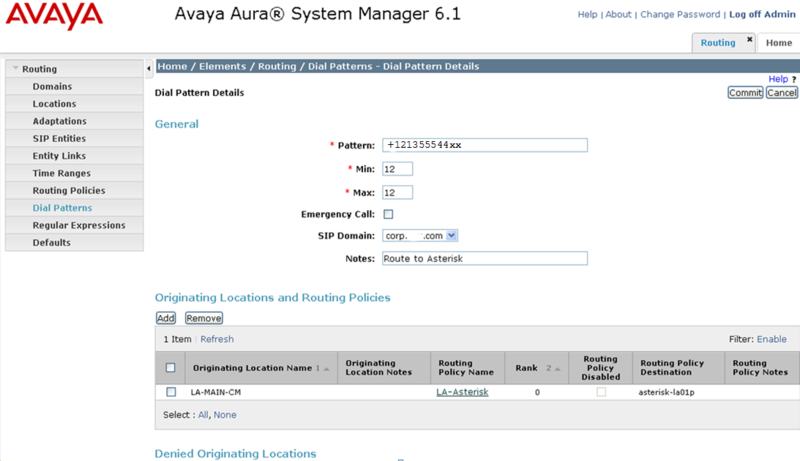 facing same issue of Calls coming from Avaya (CM & SM) to Asterisk, but we cant make from Asterisk..
What setting should we check to solve this issue, im from asterisk side…need the guidance to solve this in Avaya settings.. Please let me know…we r at client side. I did not register endpoints to Asterisk, but I believe I was able to call from the CLI just fine. The first step is to see if the problem is getting out of the Asterisk okay. When you debug from the CLI, is it sending an invite to Session Manager? If so, the problem could simply be session manager programming. If you do a traceSM in session manager (and show the call processing) you should see if the call is getting to SM and more importantly, if SM is routing it correctly. Thanks for taking the time to lay this all out. I did an early integration between Avaya and Asterisk about 7 years ago with PRI’s. Now I’m back in the Avaya world after a 5yr hiatus and am looking to use Asterisk for some special applications and save a chunk of money over using Avaya’s solutions. Very cool Mark! Avaya CM/SM and Asterisk work fine technically, but they are at opposite ends of the spectrum culturally. There don’t seem to be many places that have Avaya (or Cisco, Siemens, Nortel, etc.) that are looking for Asterisk solutions. And vice-versa. Please let me know how it goes. O’Reilly’s “Asterisk The Definitive Guide” has a great chapter on using Asterisk for a standalone voicemail server. I would like to use it for a fax server myself. I have an old fax server that some users still love. It will eventually die and I’m not looking forward to it. Aslo i get a Not route to determine on SM, The calls from CM or SM to Asterisk works great, its a sip trunk with udp tranport. But if i restart the SM, the calls from Asterisk to CM work great within 30 min, after 30 min , the call failed with no route message. Any solution? They fail in both directions after 30 min? My first thought is to check the SIP entity. In System manager, go to home->session manager->system status->SIP Entity Monitoring then click on your Asterisk entity. However, my Asterisk is currently down but the entity is showing u, so I guess that’s not a good indicator. If one side is not responding to OPTION messages, it might take it out of service but I would think it happens within a few minutes, not 30. 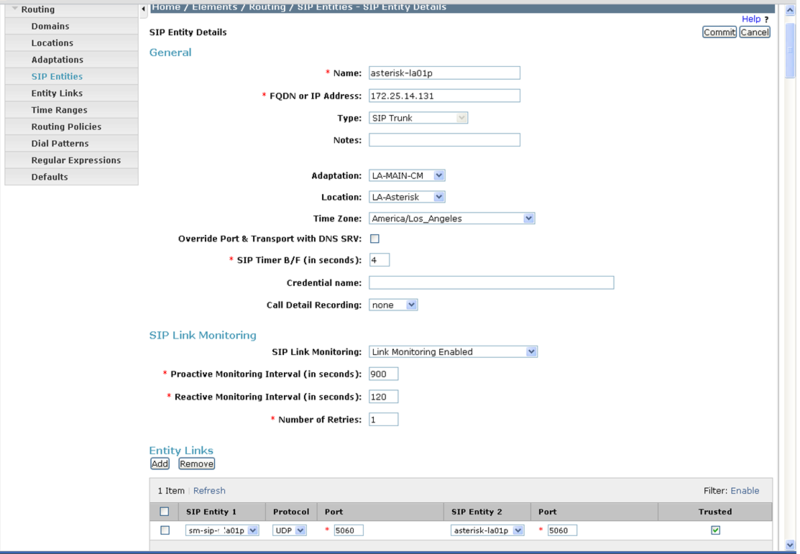 If you check Home->Routing->SIP Entities and look a the detail for your Asterisk, what is the value for SIP Link Monitoring? If you change this to “link monitoring disabled” will it last longer than 30 min? QJ – I believe the issue you are experiencing is due to the session refresh interval timer. There is a setting, under Asterisk SIP Settings, that will allow you to increase that value. In my CM, I have that set to 1200, I matched it to be the same on Asterisk, although I doubt the two play nice with this feature. You might as well turn it up as high as possible. Hi, I also experienced similar issue when integrating AVAYA-SBC-Lync scenario. Its because one field in SMGR was set to 1800 s means 30 mins. I consulted AVAYA and they recommended to change that value to 0000 and everything is working fine since then. Brilliant guide for those looking at integrating a Avaya SIP trunk to any Asterisk based platform. Thank You Roger. My pleasure CJ. Thank you for the kind words. I set up similar configuration with direct rtp enabled on CM and Asterisk. If you hold/transfer/conference the call you have oneway audio in my case. If you list trace the station, you should see the UDP port that it’s trying to use for audio. These may be mismatched between the network region and asterisk. The /etc/asterisk/rtp.conf file contains the start and end ports. These should match the ip-network-region of the Asterisk. I’m sorry about your troubles. I had a similar problem between the CM and MAS when calls would leave a caller application, ring a station, then go back to a mailbox I would get one-way audio. I never could figure it out and eventually used vectors instead of the caller app. One way audio is a pain. Please let me know what you find. You don’t need to apologize, I setup this configuration not for your guide. I dump sip messages in 3 points – SM, asterisk and sip phone on my pc and make call from sip phone connected to asterisk to h.323 phone behind tha CM. After the call was established, there is no problem with it. In trace I see that rtp traffic go directly between sip phone and h.323 phone. When I press HOLD on h.323 – avaya start sending rtp from medpro to sip phone, and sip phone still sending rtp to h.323. After I go back to to call-appr, CM send reinvite without SDP, asterisk reply 200 ok with SDP and send reinvite to sip phone with previouse avaya sdp (medpro). Ater it avaya send ACK to 200 ok with SDP (c=) but it’s too late. In this situation sip phone send rtp to medpro and h.323 send rtp to sip phone. This cause oneway audio. I google some ingo about that https://andrewjprokop.wordpress.com/2014/04/16/sip-media-management-early-offer-vs-late-offer/. It knows as late offer (sdp in ack). To work it well I need to force avaya use early offer or asterisk use late offer, but i don’t know how. In CM 6.3 in signaling-group settings not presented Direct IP-IP Early Media (a lot of references in internet). I think it can fix this ptoblem. Off the top of my head, I don’t know how to do it either, but your mention of no SDP in the re-invite reminded me of a problem I had between the Avaya SBC-E and a Cisco CUBE. Because there was no SDP in the re-invite, we were getting one-way audio 100% of the time. Tracing back, the CM wasn’t putting SDP in the re-invite and of course the SM and SBC were passing it through that way. The fix turned out to be a delayed SDP handling in the SBC-E. That fixed it. The SBC would then re-send the SDP in the re-invite and it made the CUBE happy. Do you have an SBC? It might seem crazy, but can you build the trunks to Asterisk through the SBC? Whatever SBC you have might be able to handle the delayed SDP. I can post screenshots if you have an Avaya SBC-E. But I’m using Asterisk built straight to my SM without any issues. Hi Roger. I have an SBC and the calls are neing dropped after holding them due to CM not sending SDP in re-invite. How did you managed to put the SDP in SBC messages? Did you made it by using scripts? Oh wait – in my case it was an SBC setting. But maybe you don’t have the same SBC. I was NOT able to fix it in CM. Well, I’m using an ASBCE 7.0, which is similar to 6.3. I tried to enable “Delayed SDP Handling” with no results. That’s different than my issue. I also enabled “re-invite handling”. In my case the SDP wasn’t in the re-invite. I don’t know why CM would send BYE immediately. Is this for every call? I was using AT&T and it was only in specific situations (Cisco CUBEs) with other on-net AT&T customers. Is your CM hanging up for every call? Yes, it happens in every call, no matter is incoming or outgoing. CM does not send SDP in re-invite but expects to receive it in 200OK. Just to clarify – CM expects SDP in the 200 OK response and if it’s not there, then it will send a BYE? If this is true, I wonder if there’s a system param in CM. If I have this right, then I’ll ask around. That’s my conclusion since I tested the same scenario but for internal calls and SIP calls against an IPO. in all cases CM sends re-invite with no SDP and receives a 200OK with SDP, hold works fine, MOH is heard and retrieve works as well. The issue is related to calls through SBC only. That’s the reason why I say that CM is expecting an SDP within 200OK message and then replays back with an ACK that contains it’s own SDP. I’m sorry to hear it. So calls are going TO the Session Manager okay? And from there the calls are not completing? If that’s the case, are you familiar enough with traceSM to troubleshoot with that? When you start a traceSM, you can choose to see the routing logic debug as well. Let me know if we should start there, or if you’ve already checked that. Huge fan of the blog. It’s amazing! I am having a session manager asterisk issue and I was hoping you might have some insights. 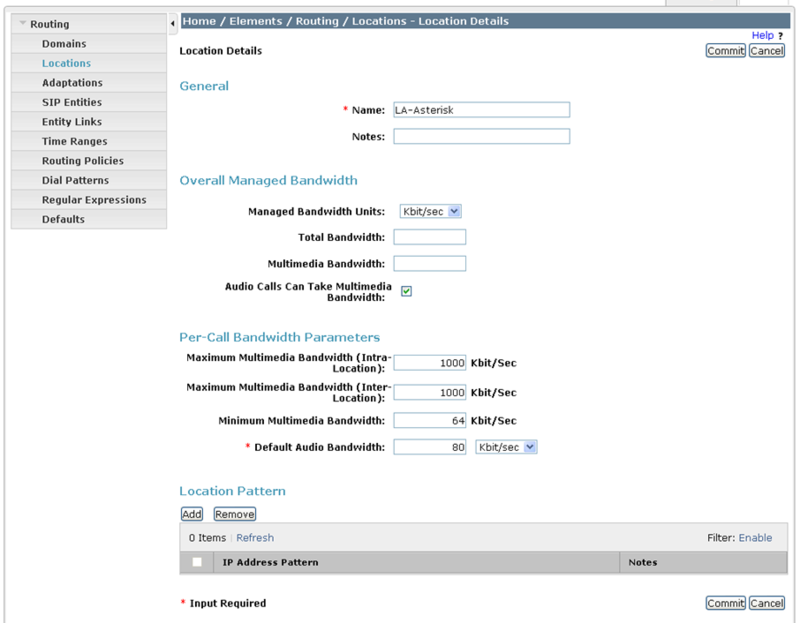 I have my FreePBX appliance connected to my Avaya Session manager via SIP as a trunk for outgoing call processing. 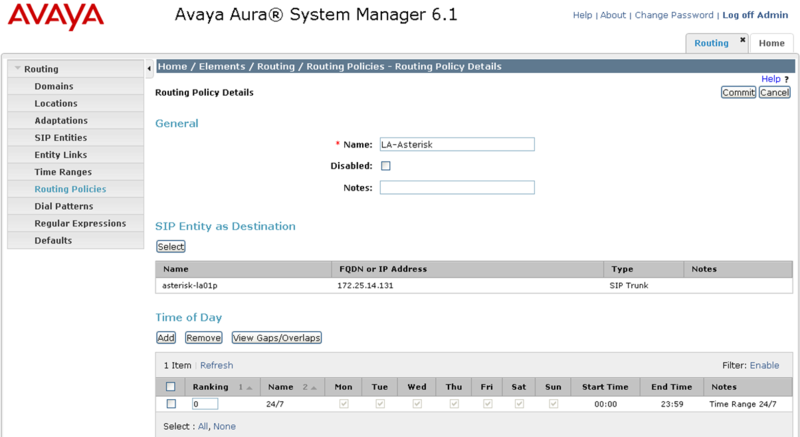 It works great, except I have had two incidents over ~8 days (thousands of calls in between) where the connection shows as “OK” on the Asterisk side, but not connected on the Avaya Session Manager side. Almost like my 5060 port is closing and I need to reboot FreePBX to resolve the issue (losing pending and active calls). It’s pretty basic. Does this look correct? Is anything missing? The last question I had was if there was a way to have the asterisk trunk status have a more accurate reflection of what is going on (versus just showing as “OK”)? Thanks for your time and any guidance you can provide. I also have a webpage running off the server displaying the following commands. They are used by 3-4 people simultaneously to keep an eye on things without having to be logged into the terminal. When they are on the page, it refreshes every 30 seconds. Wow, that’s REALLY nice of you, Mr. Comtech! And thanks for that little tip on getting trunk status. I don’t do anything like that. I do have a little nodejs script that pushes AMI events to a collector web page, but it’s for a whole different application and is a pain to set up. I do most of my stuff in perl, php, and nodejs. I wish I knew bash a bit more. Anyway, nodejs and AMI would give you packets sent, received, and lost in real time. Send me a note at roger (at) RogerThePhoneGuy.com if you’d like more info on that. And thanks again for the kind words! NOTICE[C-000001ba]: chan_sip.c:25791 handle_request_invite: Call from ‘avaya’ (X.X.X.X:13421) to extension ‘44444’ rejected because extension not found in context ‘office_vm’. A previous Administer here configured Asterisk. He is gone and unfortunately I am new to Asterisk. Can you please help point me in the right direction to locate where the main voicemail phone number needs to be configured in Asterisk? I have looked through the voicemail.conf, extensions.conf and sip.conf and I don’t see any entry for 44444.